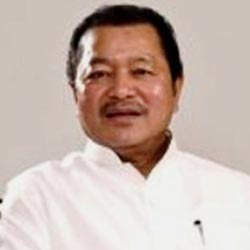 Aizawl, Aug 17 : Mizoram Chief Minister Lal Thanhawla today appealed to Prime Minister Manmohan Singh to ensure safety of north eastern people living in other parts of the country. An official statement said that Lal Thanhawla held telephonic discussions with the Prime Minister and Home Minister Sushil Kumar Shinde. The Prime Minister told the Chief Minister that there was no danger to the people of the north eastern region living in the other regions of the country, it said..
Lal Thanhawla also wrote a letter to Karnataka Chief Minister Jagdish Shettar to ensure the safety of the north eastern people and take steps to prevent any action targeting them. Meanwhile, Mizo Zirlai Pawl (Mizo Students' Federation) made an appeal to the Centre and the state governments, where students from the north eastern states were living, to take immediate steps to defuse tension.